We take more photos than ever thanks to mobile phones and it is easy to build up a large collection of photographs from events, holidays, trips and so on. When you have thousands of photographs, finding the one you want can be difficult. Flicking through thousands of thumbnails is not a good way to find one. For this reason, at one time we would spend hours in photo managers or organisers manually adding tags and categories to each photograph. It was slow, long and tedious work. It wasn’t much fun. Those days are gone and you now no longer have to tag photos with descriptive words and organise snapshots into categories in order to be able to find them. 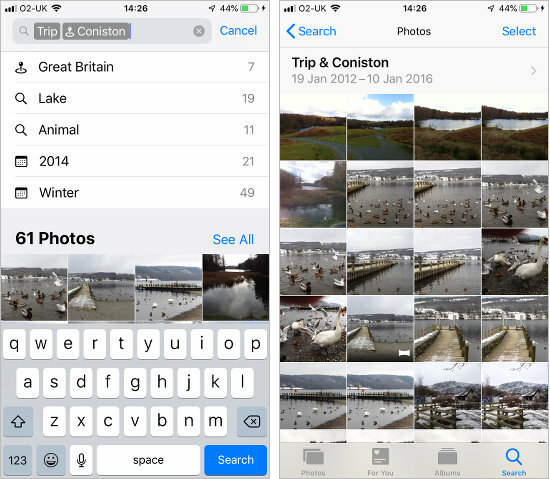 The Photos app on the iPhone and iPad can find photos by using two methods. One is geotagging, which provides the location where the photo was taken, and the other is AI analysis of images to automatically determine the content. Basically, the Photos app can tell what is in a photo without you having to tag it. It isn’t perfect and it might not get everything right all the time, but it is pretty good and very clever. It is automatic too, with nothing to do on your part. Photos knows what photographs contain and this enables you to search your photo collection for specific subjects, events or locations. Press the Search icon at the bottom and there are a few suggestions, such as People and Moments. I had suggestions like Autumn, Trips and Weddings. I never told the Photos app I had wedding photos and it worked it all all by itself. Perhaps it looks for lots of photos of a woman in a white dress. However it works, it is very clever. You will have different Moments of course. I selected Trips and it added it to the search box and then suggested several different places I had been to, clearly based on location information. Your trips will reflect your own activities so they will be different to mine. Select one of your trips and Trip is added to the search box. 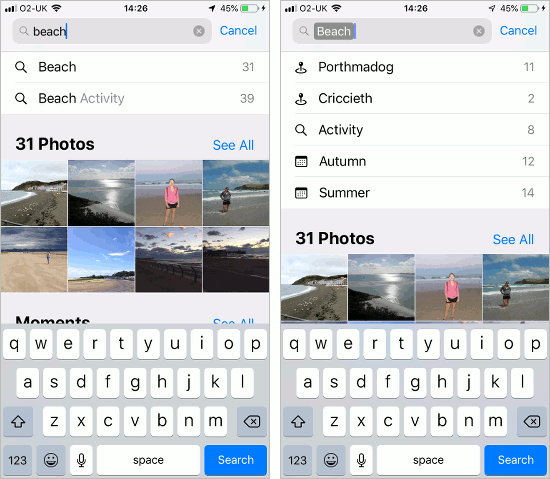 A new list of search refinements is displayed and you can filter photos further by tapping more suggestions. At any time you can jump out of search and view the photos by pressing the See All link. This shows thumbnail images of the photographs and you can browse them view them, and so on. You don’t have to start with a Moments or People suggestion and you can simply type in your own search term. For example, to find all beach photos you would simple type ‘beach’. Without any tagging, it found all the photos I had taken at beaches. It then presented a list of places to filter the results by, so photos at a particular location can be viewed. Of course, the Photos app might simply be looking for location information, but it is more clever than that. Try searching for people and it shows all the photos in which they appear, or even type in something like ‘cat’ or ‘dog’. 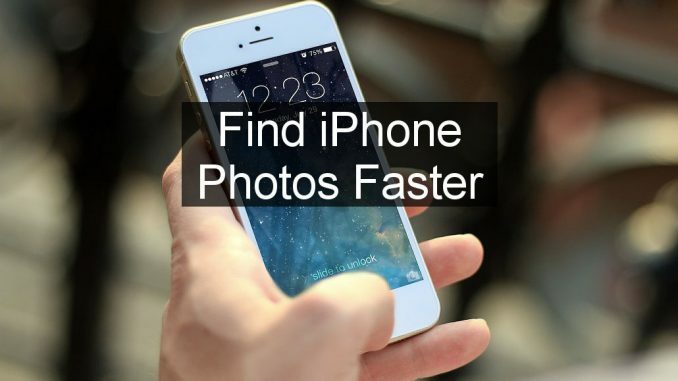 It can clearly distinguish common pets and find them in your photos. To be honest, I never did get around to tagging all my photos with descriptive words to aid searching. It was just too much work. Now I am glad I didn’t waste my time because Photos can find the photographs I want to see without tags. Google Photos is a major competitor to the Photos app and it works well on the iPhone. 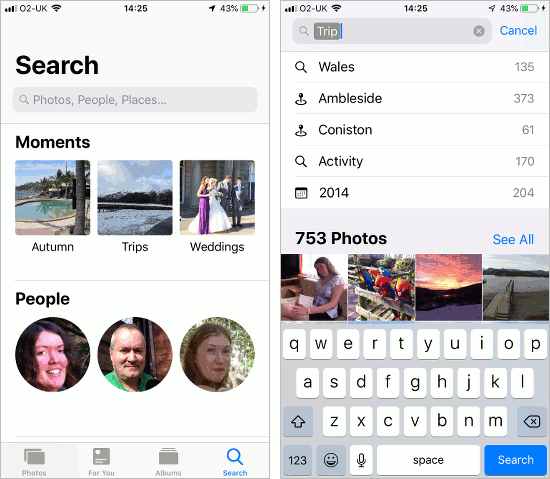 It can still do some tricks that Apple Photos cannot do and I like the unlimited free storage, but when it comes to searching for photographs I think Apple has done a better job than Google. The search facility in the Photos app is excellent and easy to use.